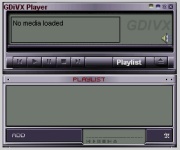 GDivX is a Windows Media Player replacement for playing, primarily, DivX Movies, and any video format supported by Windows Media Player (DirectShow). It can also display subtitles and VCD playback. Version 1.9.9.5 features new functionality including broken AVI playback, mouse-wheel support, better subtitle support, playback control from tray, and more. Thank you for your continued support. We have had a great response since the last update. Enjoy.